Finally, they figured out how to post a video SWIFTLY on the Blogger platform! After a brief wait at YouTUBE, this short video is now instantly install able here, simply by pasting in the link. Put simply, there is zero upload time so I am down with that! 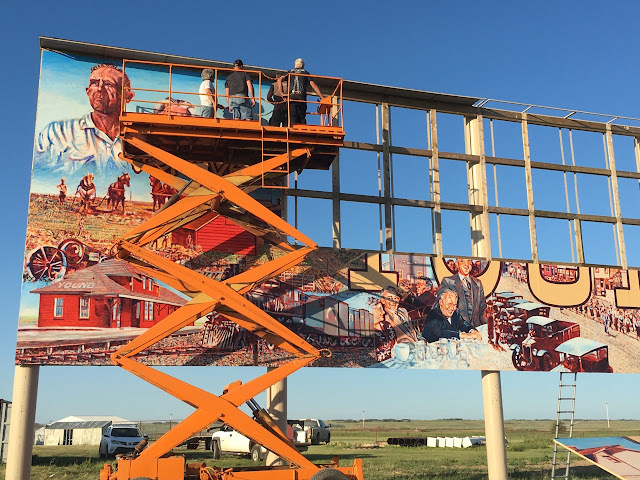 After painting a wide swath of over 60 large murals across Canada over the past 30+ years, Canadian artist/author Michael R. Gaudet's latest mural (of monumental proportions) has been installed just outside the Village of Young, SK. "Forever YOUNG" is twenty feet high and eighty feet long, mounted ten feet above the ground on a huge steel frame that is engineered to withstand gale-force winds. The mural is claimed to be the "World's Largest Free-Standing Mural". This stunning photo shows the massive scale of "forever YOUNG" as the panels are installed. 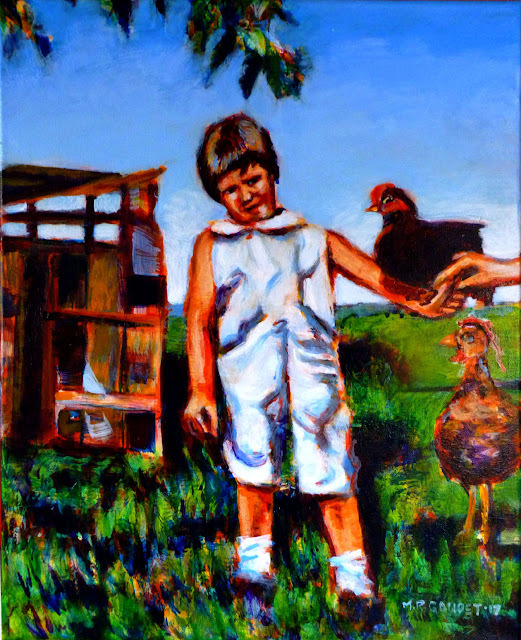 Gaudet says, "I always use professional-quality artist's acrylics for my paintings and murals. These paints are considerably more expensive than exterior latex, however they are the superior product for murals. I usually shy away from painting directly on an existing wall, because a mural is only as good as the surface it is painted on. Instead, I use a specially engineered painting panel that gets installed on the wall. 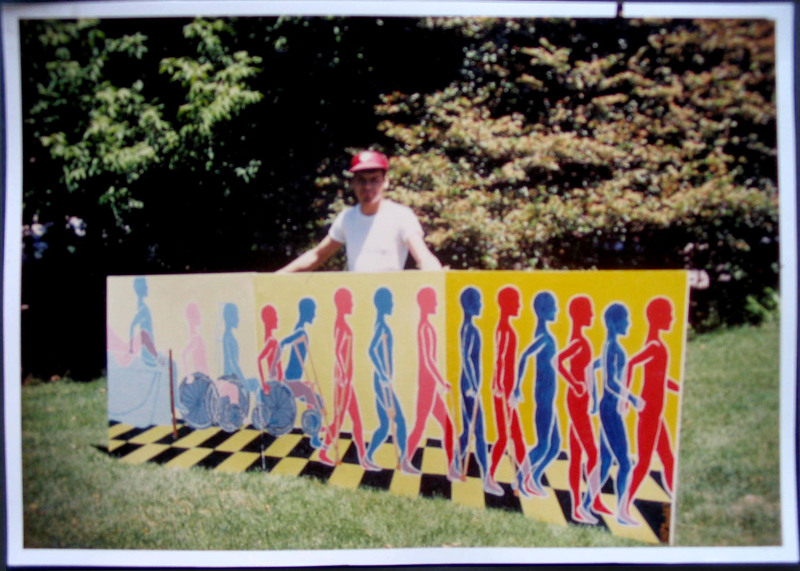 In the case of the Young project, we opted to build a structure on which to install my mural." 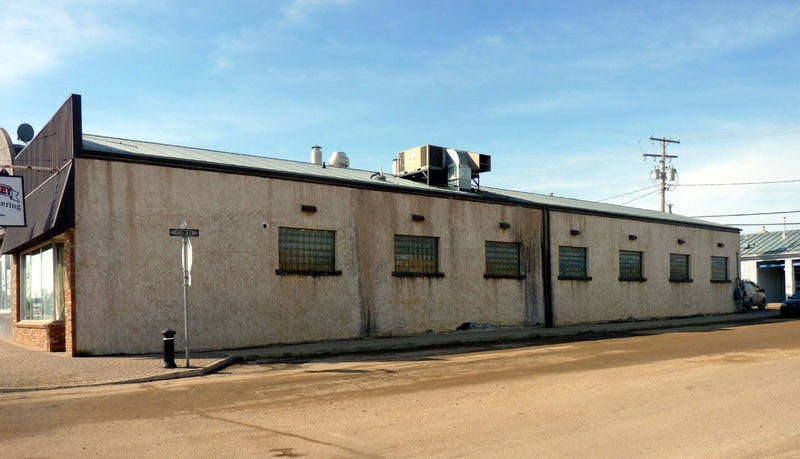 "I will begin a mural project by collaborating with the stakeholders in order to come up with an authorized design. Once this happens, the rough sketches are upgraded to a scale drawing that is suitable to be replicated as a limited edition print. The print can then be marketed in order to raise funds for the mural. This is a formula for success." The mural "forever YOUNG" faces the busy #2 highway just south of Young, SK. The "forever YOUNG" mural features thirty-one images in a "montage" style design. All of these scenes and people are recognizable. They are sourced from the Young history book and also from private photograph collections from the community. In the coming days, a "legend" will appear on the left-hand side of the mural. This legend will feature an outline of every aspect of the mural that will have a number designating its meaning. Below this will be a list of all the pictures that will allow viewers to identify all of the images. "This huge mural was very challenging to paint," continues the artist. "Not only was it a lot of physical work, at one-thousand six-hundred square feet, but the images themselves were very detailed and rigorous painting. My technique calls for about fifteen glazes over the entire surface, so in all, the painting entailed about twenty-four thousand square feet of application to finish. That's a lot." Plans are underway to celebrate the completion of the "forever YOUNG" mural with a ribbon-cutting ceremony on August 26th, 2017. Everyone is invited to attend. Come out to lend your support to this astonishing accomplishment, inspired by the never-quit attitude of the planning committee. Taking a pause for the cause while working on the "forever YOUNG" mural. Please visit www.mrgaudet.com to read more and to purchase a copy of "Dancing with Rejection: A Beginner's Guide to Immortality". This is a widget. Click through to read my latest "Kickstarter" update. Yesterday I attended a meeting at Queen's House Retreat Center in Saskatoon. Last week a couple of ladies dropped in to see us here at "G-G's Gallery & Gifts" at Manitou Beach. For those of you that have been following, you will know that this is the seasonal business that my wife Sharon and I have been running for 9 years now. The ladies were excited to meet us and shared the germ of an idea... that I should rekindle my connection with Queen's House Retreat... just to see what might happen. I started to think about that and decided that yes, I would set up a meeting. Well! It was a wonderful, inspiring half an hour! 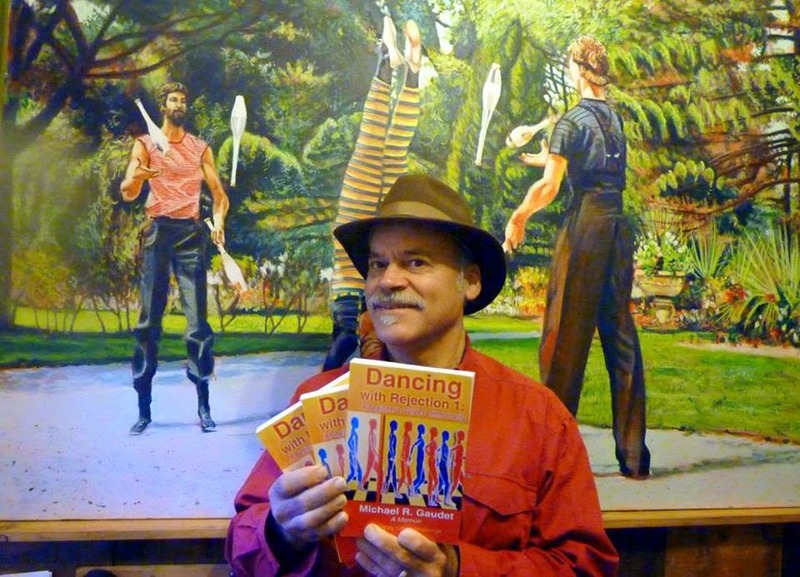 I guided the Director and the Program Director through my mural-painting portfolio and also read a few select passages from my 1st book "Dancing with Rejection: A Beginner's Guide to Immortality". 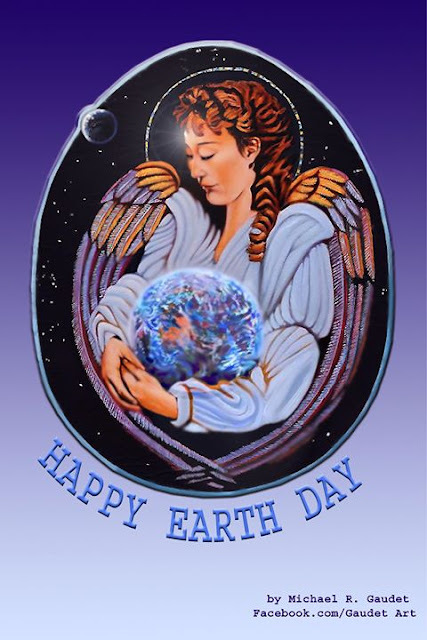 I was informed that Queen's House is especially dedicated to the "Trinity" and also to the stewardship of the Earth. These two salient fact sat very well with me, as the themes have loomed large in my artistic journey. Suffice to say, my meeting at Queen's House was "pregnant with possibility". In the meantime, I have another large (100' x 12') mural to paint this summer...so that means I will be busy with that (and life in general) until the fall of '17. Stay posted, the creative fun is still going full-steam! After waiting for almost five years for the Young Centennial Committee to get their ducks in a row, my patience has been richly rewarded. I was on site to capture stunning images of the massive mural installation. A scissor lift capable of ascending 40' into the air was pressed into service. A combination electric and hydraulic lift was brought on-site. The large working platform, in tandem with a tractor with fork-lift, made ideal equipment to lift the heavy panels into their respective positions on the massive frame. This shot gives a good impression of the scale of the frame. The scissor lift requires outriggers when extended high up in the air. In the above picture, you can see the huge ( 16" diameter) steel posts that were deemed necessary to hold the 20' x 80' expanse of painted panels. The structure was engineered to withstand very brisk winds. Also, considering the predominant (prevailing) winds come from the northwest, the infrastructure is oriented to "slice" into the wind, rather than face it like huge sail. The aforementioned tractor and fork lift can be seen to the left, carrying the next panel. The finished installation of "forever YOUNG" at Young, SK. Once the "forever YOUNG" mural was completely installed, I decided to create a quick video, on my phone. I posted the video on Facebook that afternoon and within about 24 hours, 9,700 viewers partook of the great fun. Labels: 'forever YOUNG' Mega-Mural, Canadian mural painting, Michael Gaudet muralist, murals in Canada, World's Largest Business Card, World's Largest Free-Standing Mural, Young SK. 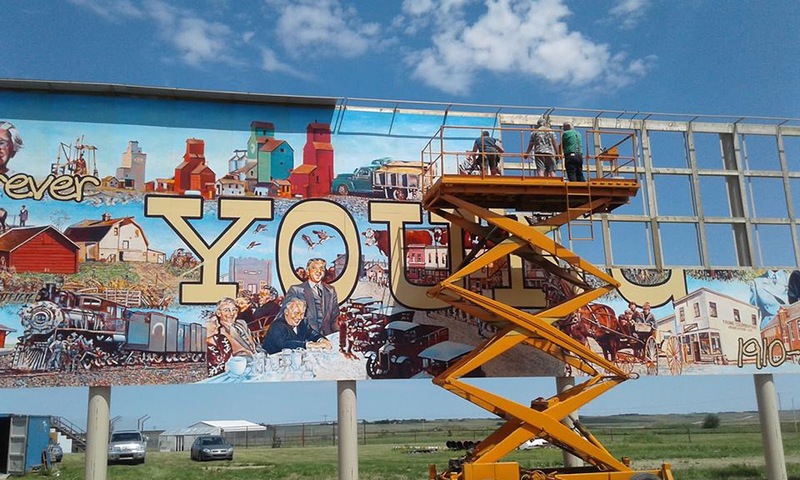 (20' high x 80' in length) mural "forever YOUNG" has been installed in the past two days. This is a huge project in every way. Not only was the painting a big undertaking, obviously, but also the gigantic frame and now, the installation. As you can see, the mural panels were lifted up 10 feet in the air and then soar an additional 20 feet up on the awaiting frame. 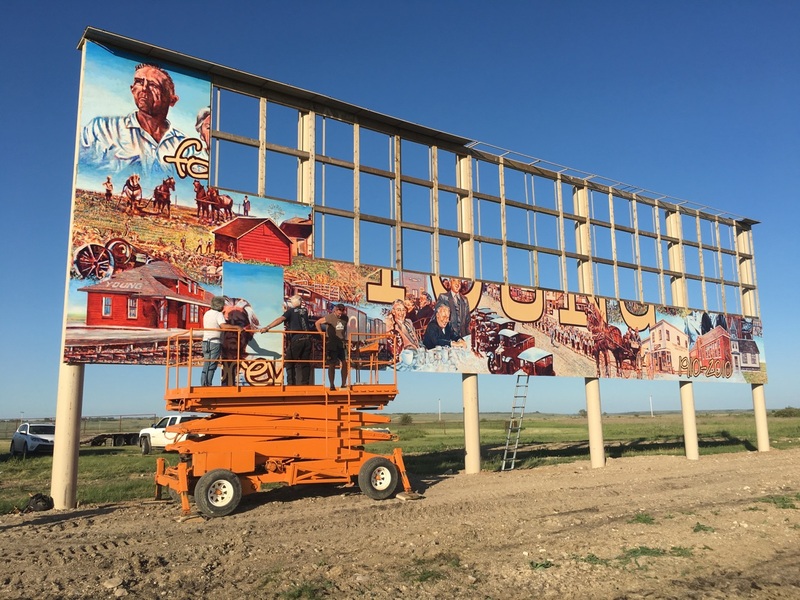 The mural is 80 running feet in length! My methodology is to paint a series of 4' x 8' panels...of an exterior-grade material with professional-quality artists' acrylics. This is all considerably costly, but it ensures incredible longevity. 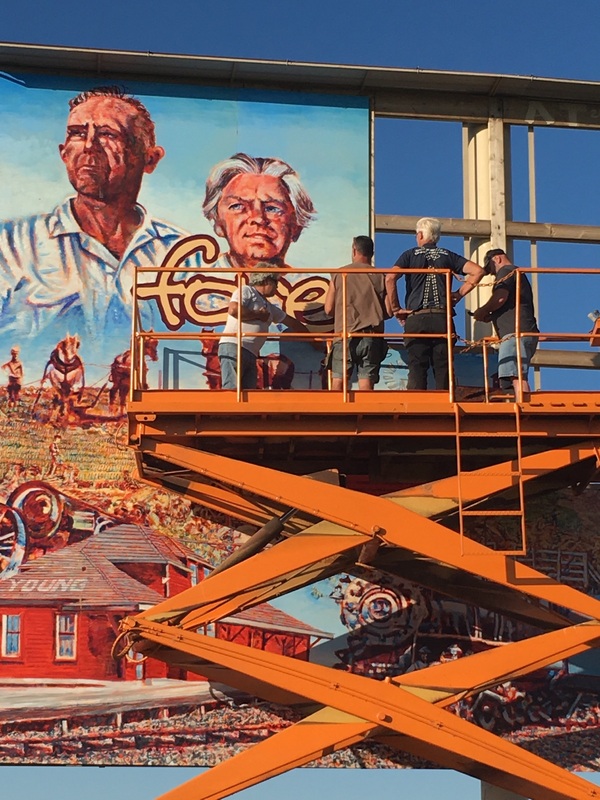 The men on the scissor lift reinforce the massive scale of the mural. As you can see, they are a bit "dwarfed" by the panels. Just about ready to lift another panel into position! Altogether there are 50 (4'x8') panels that need to be lifted up and positioned on the massive frame. As you can imagine, there are a lot of moving parts here, literally. All of the men needed to be available at one time...in the middle of a very busy farming season!...plus the equipment needed to be lined up, all to correspond with perfect weather. This is not a job that could be undertaken in high winds and certainly not rain. Luckily and happily, all of these favorable incidents lined up for this ambitious project to come to fruition! Stay posted, I will continue to chronicle this project in this space over the coming weeks. I am just about ready to start painting my next epic mural! I like it best when a mural client approaches me, not vice-versa. Although I can be competitive when the situation demands it, I obviously prefer it when the universe unfolds exclusively in my favor. That was the case for about my last 4-5 big projects, including the massive mural that I will be painting this summer. B&W Mock-up for my next HUGE (12' x 100') mural. There is still the possibility of some tweaks and changes; however, I think it has pretty much "clicked", at least in my mind. Huge Mural to be Mounted in Young, SK. Summer of '17. 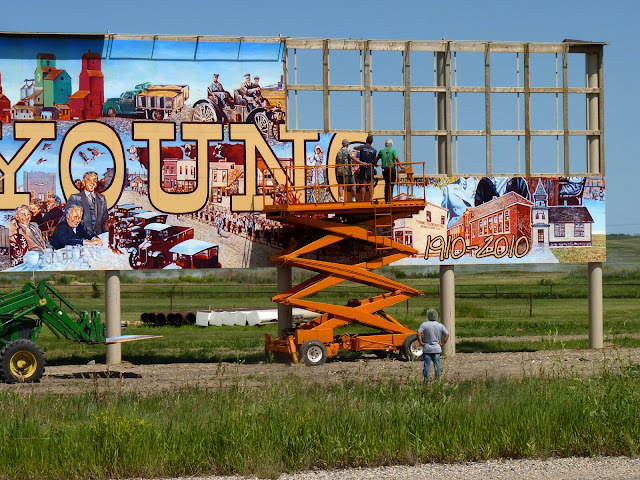 After waiting for about 4 years, it would appear that the Village of Young is ready to mount my giant ( 20' x 80' qualifies as giant wouldn't you agree?) mural this summer of 2017. I decided to pull over and make this quick video to show you how really massive the frame is. It allows for the mural itself to be mounted 10 feet off the ground. View of the partial mural while being painted at the Young Arena. The mural is 20' by 80', so with a 17' high ceiling, I had to paint it in 2 sections. Do the math. I was careful to carefully document the "Work-in-Progress" of the "forever YOUNG" mural, as it was the largest mural to date that I ever created. What a lot of painting! With something this HUGE, there is going to be a LOT of heavy physical work. So. 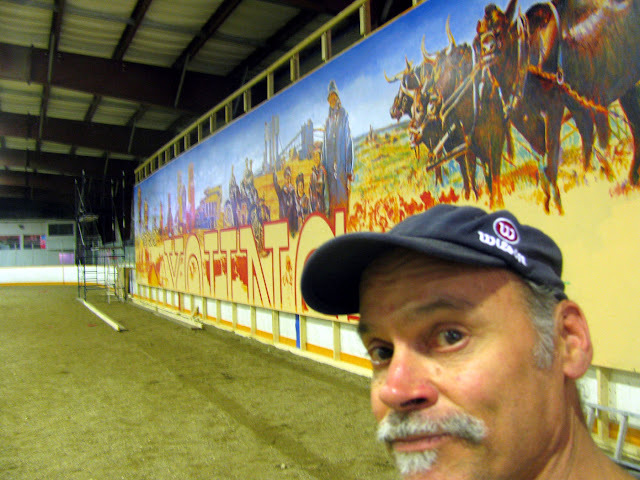 I paused during a typically busy day to take a selfie with the mural as a backdrop. Don't be a Hero, Papa ! 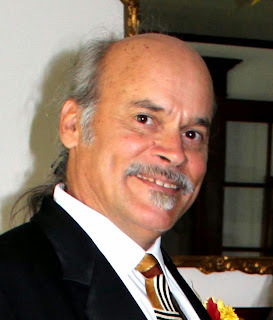 In April 2014, my daughter Ilara told me in plaintive tones, "Don't be a hero, Papa. Forget about 'setting a World's Record' for longest kidney transplant! Just get started with dialysis soon, before you have a stroke or worse with all the toxins in your blood! I don't want to lose you! Promise me you will not wait much longer. Promise!" A Work-in-Progress... my beautiful daughter Ilara comes to life on my easel. This heart-felt appeal, voiced with such urgency and poignancy... was a big part in my decision to agree with my doctor's equally urgent admonition. Of course my wife Sharon had a lot to say about it... really, we KNEW the time was near, so we undertook to travel between Saskatchewan and my home province of Nova Scotia. It is 4287 kilometers each way, and we drove the distance TWICE each way in 2012 and 2013! In rough figures, that was 17,148 kms of driving all told. 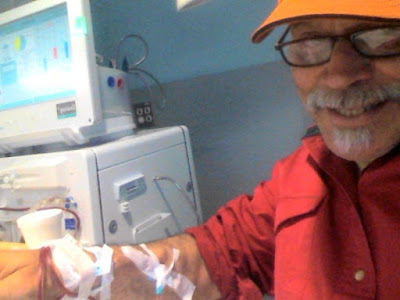 Of course I DID return to thrice-weekly dialysis treatments, or else I would be long-gone. There is a saying, "Dialysis: Do or Die!" It is with all of this and more in mind as I proceed through each day... and week, and month. I have no time or desire for a 'pity party". At all. 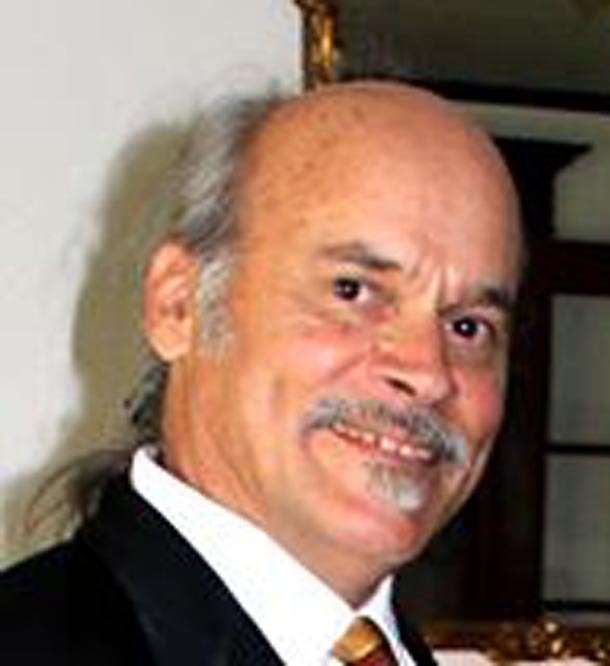 I will keep on writing and painting, loving and caring about the heaped-on blessings of LIFE and a LIFE WELL-LIVED. 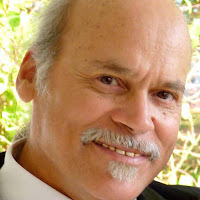 It is a with a deep well of GRATITUDE for my energy levels that allow me to stay HAPPY and PRODUCTIVE. Please visit www.mrgaudet.com to read more about Michael, his artwork and writing projects. 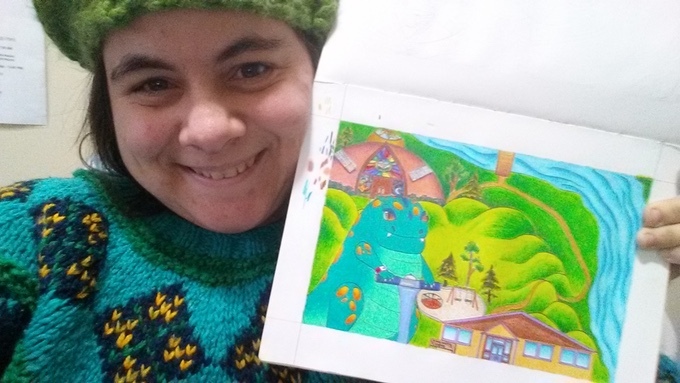 I am writing to congratulate my talented daughter Ilara Stefaniuk-Gaudet on the success of her Kickstarter Campaign . 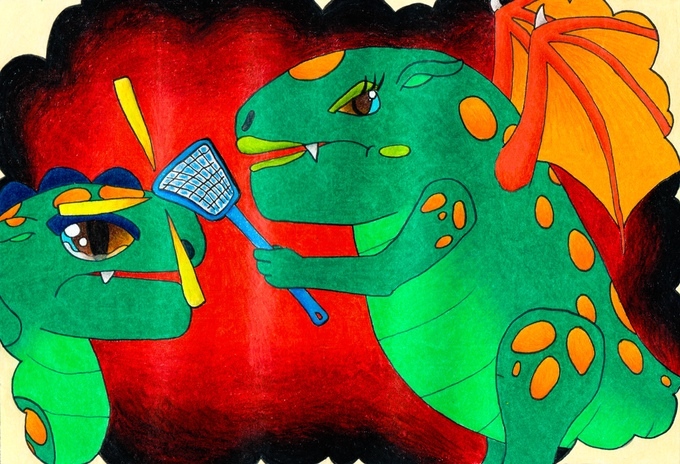 Ilara has created a compelling illustrated "Children's Book", as the theme of her Kickstarter called "The Secret Wish of Dragon H". The author holds one of her original illustrations from "The Secret Wish of Dragon H". The author's goal with the campaign was to pre-sell 100 signed copies of her book and she has successfully accomplished this in the 1st 5 days of the 30 days she has allowed. Now, she will carry on to hopefully generate additional funds from worldwide contributors (that would be YOU) to offset some of the hefty production costs. In addition, Ilara has created several STRETCH GOALS aimed at raising awareness of the LBGTQ community. To read more please visit and support her Kickstarter Campaign. Please visit this link to find out what all of the buzz is about. This is the time for social change and enlightenment, and I am proud to say... that this project has the power to nudge ahead with this goal. This post is not only a CONGRATULATIONS to you, Ilara, but also ENCOURAGEMENT to keep YOUR EYES on the PRIZE... I hope that your campaign will continue to flourish and that also, your excellence will be celebrated and appreciated by "those that matter". Now, I am launching a special appeal to all of my readers to please SHARE this POST with all of your friends. 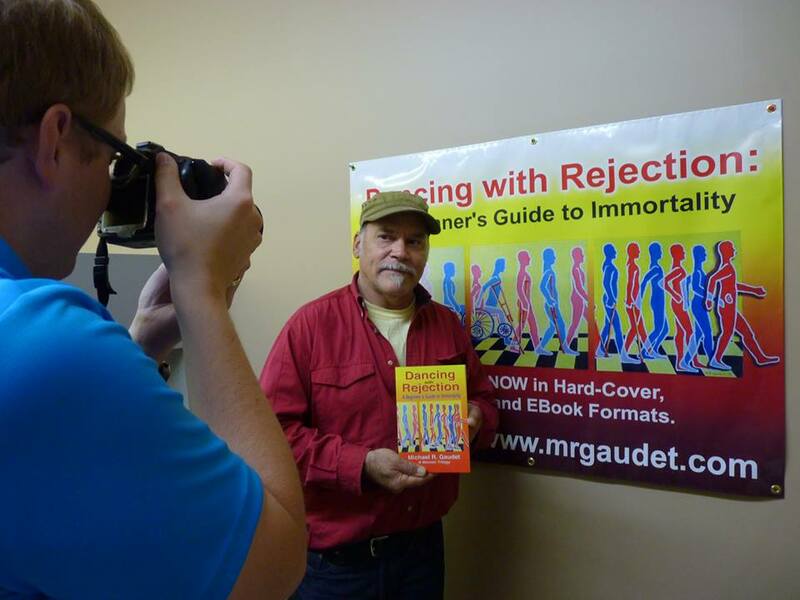 Michael R. Gaudet stands in front of the "Dancing with Rejection" banner, holding one of his books. 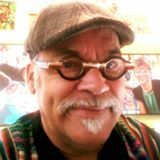 One of the "rewards" that I offered in my recent "Kickstarter" campaign... created to pre-sell advance, signed copies of my 2nd book (called "A Work in Progress: The Life my Brother Saved") was... for every contribution of $500.00 or more, I would create a painting based on the photo or idea of your choice! Four individuals opted for this reward during the course of the campaign. 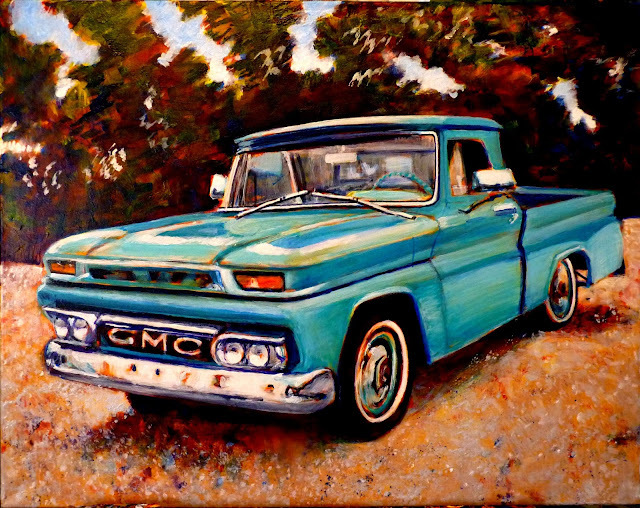 Painting of '65 GMC truck, for a "Kickstarter" campaign reward, in return for a contribution of $500.00 or more. I wanted to post this to let you all know that indeed, I am busily fulfilling my obligations to the generous contributors to my Kickstarter campaign, even as I carry on with the #1 goal of finishing the manuscript for Book 2... and also, bringing it closer every day to the ultimate goal of publication! 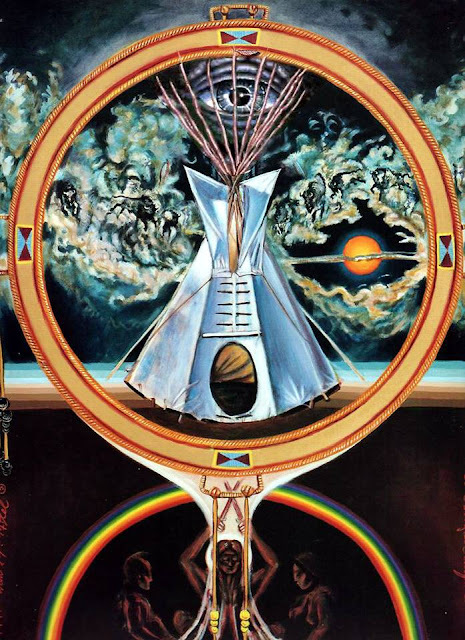 Yesterday morning, I was working on the manuscript for my 2nd book in my Trilogy Writing Project called "A Work in Progress: The Life my Brother Saved" and the chapters that described the "Visceral, Mystical Painting Experience" aka "Vision" was in my cross-hairs. The writing projects back to the year 1992. 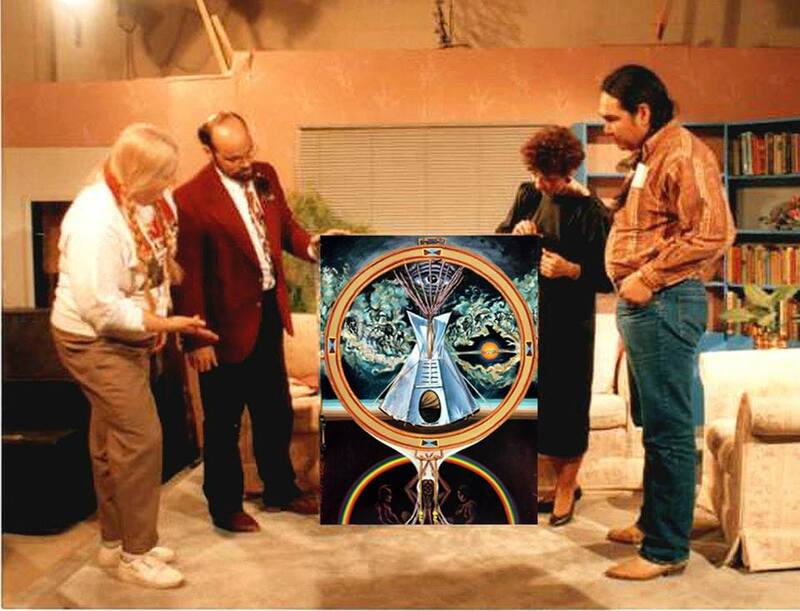 It is a very emotional chapter, as it describes the hands-on approach that my dearly departed blood-brother Douglas Severight took during the painting process. Not to give too much away, however it can be said that this was an experience like no other in my long painting career! I felt the powerful energy that Douglas poured into the painting, as he hovered over my hand as I worked, imparting a current of energy into my brushes. 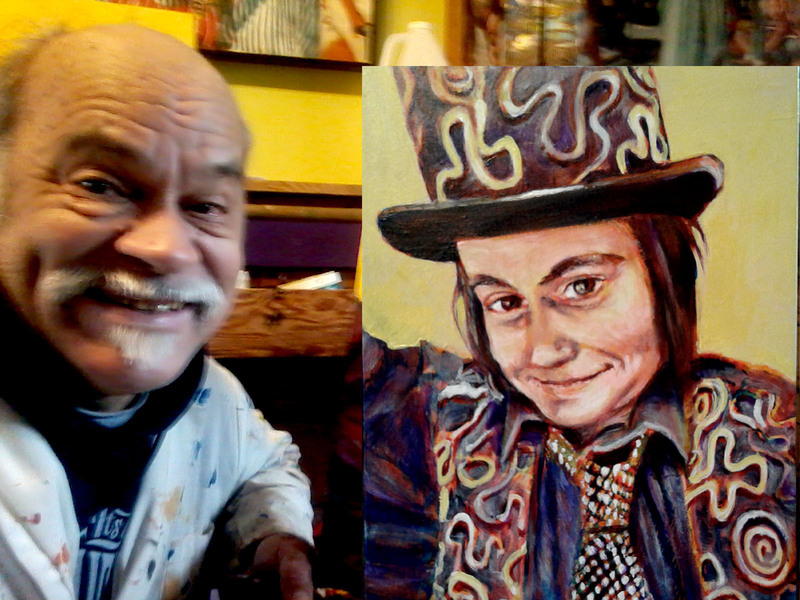 After many joyous days of painting "under the influence" of Medicine Man Douglas Severight, we had created this! These images will appear inside the pages of Book 2, just wait and see. To read more about my writing and artwork, please visit www.mrgaudet.com You can purchase Book 1 of my trilogy writing project called "Dancing with Rejection: A Beginner's Guide to Immortality" at this link. Join the worldwide community who have read this book! Now, after the brief departure to SHARE some GOOD NEWS for PLANET EARTH, how about getting back to GaudetArt? Here is a recent painting... created in 2017...that recreates a "nostalgic" image that hearkens back to circa 1950. My wife Sharon showed me this photo that pictures her nervously holding the family rooster, named "Chico", in her outstretched hand. "Chico" was so heavy that Sharon's grandmother can be seen stage right...helping bear the weight. "Chico" was too heavy for Sharon to hold up on her own, so her grandmother can be observed helping her. Or at least, her hand protrudes into the picture frame from the right. I enjoyed painting this whimsical image, based on the vintage black and white photo furnished by Sharon. I think her mom gave this, among others, to her. Or possibly, Sharon raided the family photo album. I'll have to ask her about that. 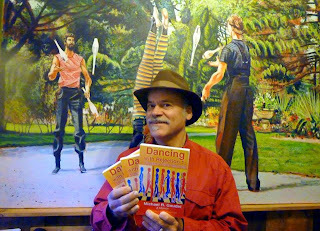 Thrilled to finally hold the 1st Proof Copies of "Dancing comwith Rejection: A Beginner's Guide to Immortality" in my hands. Click on this link to purchase your copy today in your choice of 3 formats. Full disclosure: I do not have any financial interest in the Canadian Pipeline Industry but that may very well change after the discussion I had at a social gathering last night. A few years ago, I imagined a scenario where oil pipelines would have some sort of automatic shut-off valves in small increments (eg: every kilometer or so) along the line, so that in the event of a breach, any spill could be immediately contained within a restricted length. Sounds practical and safe(r), right? I met a pipeline worker last night at a social event who put it to me like this: he works for Enbridge, which is a major supplier of pipelines. He informed me that they are the proprietary owners of a very innovative new technology that in essence, creates the safeguard described above. For every kilometer of pipeline that they lay, a system of automatic valves are integrated into the system. Called "Emergency Flow Restrictor Device", or EFRD, the concept is elegant and ingenious. The EFRD is an information-sending apparatus that communicates in real time with an array of computer screens manned by a team of technicians. If there is ever the slightest increase or decrease in the PSI flow of material through the pipeline, (which might indicate a breach aka leak) the valves that were up to that point open to allow the flow of material SNAP SHUT on either end of the one KM length in which they are installed. This effectively isolates the breach from the rest of the line and dramatically minimizes the potential volume of unwanted discharge, thus mitigating environmental damages. From what I understand, Enbridge has incorporated this technology, and in doing so, has "raised the bar" for the industry world-wide! Considering the fact that the pipeline industry is currently valued at 17.5 BILLION dollars, in consideration of all the intensive labor and of course, the spin-off benefits to the Canadian economy, this technological breakthrough will no doubt be a powerful rationale to motivate expansion of the industry. My discussion with the Enbridge professional engineer last night has utterly changed my mindset regarding the safety of the pipeline industry as it lays plans for expansion in the country that I love. 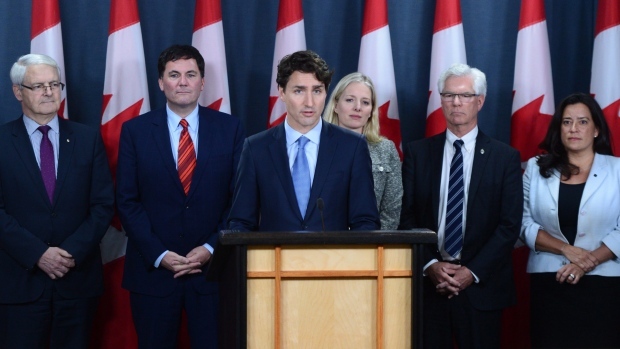 Now, seeing as how Prime Minister Trudeau has approved Trans Mountain and Line 3 pipelines, I, as a layman and Canadian citizen, feel it is absolutely incumbent upon the PMO to assure Canadians that a company like Enbridge has integrated EFRD technology into its mandate, along with other safety measures. Please share this post with your fellow citizens, as I feel it will go a long way to alleviate some of the dire concerns regarding the safety of pipelines in Canada. After my discussion last night, many of my misgivings were addressed, and I can honestly say that I feel much better about the decisions made by our government to proceed with pipeline infrastructure. 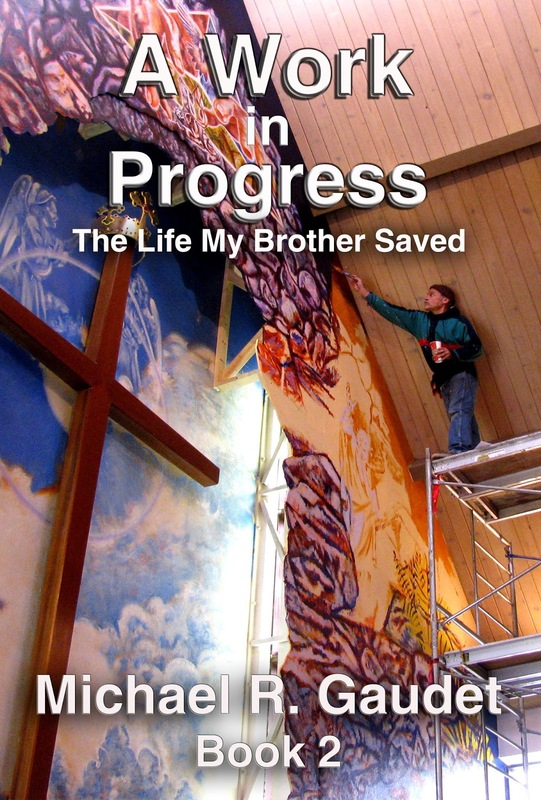 "A Work in Progress: The Life my Brother Saved" in the spring of '17. Book 2 of Trilogy Writing Project Coming to Fruition! This is an Professional Editorial Evaluation on "A Work in Progress: The Life my Brother Saved"...which is the 2nd book in my Trilogy Writing Project. Click on the embedded widget to read more.